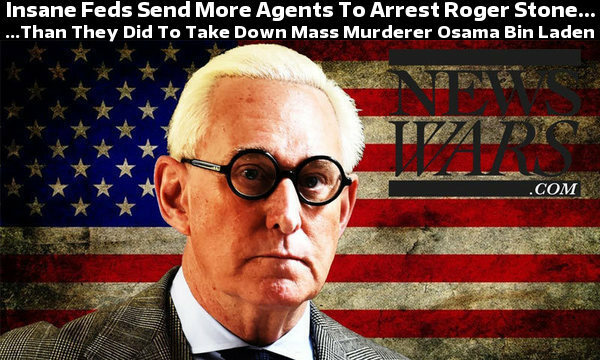 Much as I hate to digress, just as I was finalizing my research and outlining for this article, the mighty warriors of the FBI arrested the dastardly arch-villain, Roger Stone, the evil mastermind of nonexistent crimes. Realizing the terrible danger they faced in arresting an unarmed man in his sixties, nearly thirty of the intrepid lads and ladies gathered (despite the government shutdown) in body armor with real assault weapons in an unannounced pre-dawn raid, and handcuffed and shackled the monster before he could sneeze or spill coffee on one of them (or whatever). This is the same FBI, remember, who shot an unarmed woman holding a baby at Ruby Ridge and burned children alive at Waco. This is the FBI whose agents plotted against the President and used a phony dossier as “evidence” of “collusion” with Russia. Yet people like Sean Hannity continue to chant their mantra about bad leadership but mostly good rank and file agents. Certainly some agents are good people, but we need to wake up and smell the garbage…for the most part, top to bottom, the FBI is a corrupt, politicized, criminal organization, a secret police force that has no place in a free republic. It is broken beyond fixing. 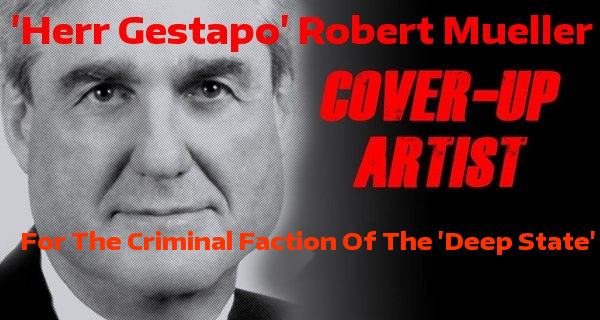 And we patriots need to remember that Herr Gestapo Mueller, despite all his power, does not command the FBI or the Injustice Department. Christopher Wray is FBI Director, and both he and his immediate boss, the acting Attorney General, were appointed and answer to their boss, Donald Trump. Trump owns Injustice and the FBI, and the counterfeit buck stops at his desk. Ultimately he, and he alone is responsible for the FBI going to extremes to intimidate, humiliate, and marginalize Roger Stone. And Stone is not the first Trump supporter to go to the mat for him, and to have his life wrecked and his savings exhausted. Yet Trump could pardon any and all of them for their nonexistent crimes, and, with his vast fortune, could make good all their financial losses. The fact that he has not done so is telling. And Trump has continued to appoint neocon swamp critters to high office, and, predictably, he and the Republicans have now folded on the government funding issue. There will be no wall…ever. But that’s a whole other story. 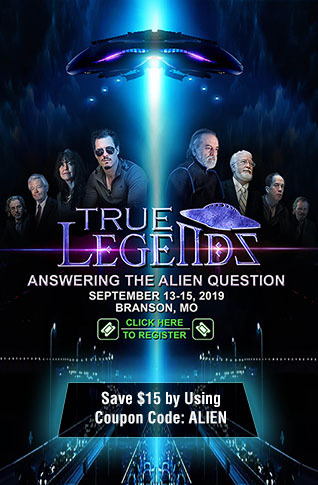 What I really set out to do here is to call attention to an unfortunate quarrel between honorable patriots…Stone and Alex Jones on one side, and Jerome Corsi on the other. All three are trustworthy and courageous patriots, yet they seem to have forgotten the experience of America’s Founding Fathers, who realized that they would either hang together…or hang separately. Basically, Corsi said that Stone asked him to contact Wikipedia founder Julian Assange about releasing John Podesta’s emails. 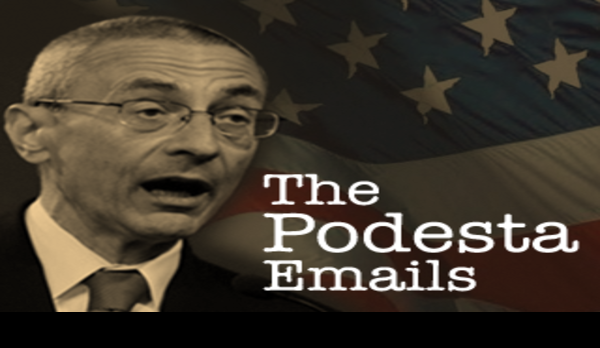 Podesta was the Witch’s campaign manager, so what is the harm in that (save to the Witch and Podesta, who deserve real punishment for their many crimes)? Assange, like Corsi and Jones, is clearly a force for good in the world, and all records pertaining to the Witch and her cronies should be made public. Yet Stone denies asking Corsi to contact Assange…this could all be a series of misunderstandings. Apparently Corsi also said, or at least implied, that Stone offered him a job with Alex Jones’ Infowars as a reward for his efforts and/or to keep him from talking about it. Again, what would be so terrible about that? And rather than keeping it all a secret, Stone, Jones, and Corsi should be proud of their efforts and their collaboration. None of this makes any sense, and, again, sounds like a series of misunderstandings. Stone and Jones then accused Corsi of being an alcoholic, and here I must weigh in, for I have personal experience and knowledge. Some years ago I went on a WND cruise orchestrated by Joseph Farah and his comrades. A group comprised of Farah and other WND staff and writers and a number of us patriots who signed up for the journey sailed out of Tampa into the Western Caribbean. Along the way we ate at least some of our meals together, and had meetings and listened to talks by some of our favorite patriots, among them one Jerome Corsi, a friendly, outgoing individual with nary an arrogant bone in his body. He went out of his way to talk to us ordinary people in the group, and I feel truly honored to have met him. Although I met Mr. Corsi, I do not claim to know the man, and he could not possibly remember me. But for about two weeks or so, I saw him virtually every day. Never once did he exhibit any signs of drunkenness…no stumbling gait, no slurred speech, no bad behavior of any kind. If he was an alcoholic, wouldn’t it have become obvious? And I don’t even recall seeing him with a drink in his hand, even at meals; he may well have had a drink now and then for all I know, or a glass of beer or wine with dinner, but, clearly, if he drank at all he drank very little. I hung out, as was my habit on warm weather cruises, on the Lido Deck, which is partly open to the sky and has swimming pools and several bars. On this deck, the geriatric set (that includes me) party virtually all day, drinking a bit too much, listening to music, swimming, and working on our skin cancers. I frequented virtually all the bars, perhaps a bit more than was wise, and I don’t even recall seeing Mr. Corsi sitting at a bar or ordering a drink. Bear in mind that he was already in his sixties then (he is a couple of years younger than I), and if someone hasn’t developed full-fledged alcoholism by then it isn’t going to happen. Jones and Stone need to cut Jerome Corsi some slack and give him the benefit of a doubt. None of us is perfect, nor do we communicate perfectly…there will always be misunderstandings between patriots. We must not allow misunderstandings to develop into mistrust and resentment, for we have enemies aplenty without making enemies of one another. And our enemies will do more than criticize us…they are playing for keeps.